Let's be honest, I'm the last person you'd expect to see in St. Louis's ALIVE Magazine. The monthly publication is hip, trendy, and totally on-point with the local social scene. Me? Um, well, my idea of trendy is disc brakes on a gravel bike, which hardly coincides with designer fashion and society pages. But nevertheless, I found myself on the other end of an interview and a photoshoot, and this month the article was published. How did it happen? Let me share! It all starts on a dark, cold, windy night. Seriously. 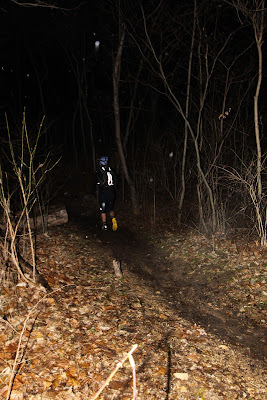 It was the night of the SHITR (a 13.1 mile trail non-race in the dark) and I had just finished running with my BTB Megan. It had started raining during the race, and the temperatures were already hovering around the 30F mark, so after we finished we both huddled in the car to unthaw. Some of the non-racers were meeting at a local Mexican restaurant so we headed over there to more thoroughly dry out and warm up. At the restaurant, we sat with my new friend Colby, whom I had run some of the later miles with, and his brother Jeremy. They are super cool dudes and just two examples of the awesome people I've been able to meet through my outdoor adventures. We shared stories of how horribly cold the SHITR was over chips and salsa, and at the end of the night, we were friends. On Facebook. Official. Then fast forward a few... weeks? months? ...anyway some period of time passed and I see Jeremy (who is a writer) posting an idea for an article. He asked for Facebook friends to nominate St. Louis endurance athletes for a potential feature in a local publication. A LOT of people replied. I saw the long list of response comments, and thought to myself "that's not me". I mean, I know I do some cool stuff, but we are lucky in St. Louis to have a very healthy endurance athlete community and there were a lot of potential stories shared. I dismissed the post, thinking "that will be a cool story to read when it's published". Maybe a day or two went by, and somehow that post showed up again on my Facebook... timeline? feed? homepage? ...whatever that's called, and something in my head clicked. You miss 100% of the shots you don't take (Wayne Gretzky). So I wrote a few sentences about my racing and hit "Submit". Who knows where that will go but, it's out there. Another few...weeks? months?...passes and by this time I've figured that other athletes have been selected. Oh well, at least I tried. But then I get a phone call from Jeremy who wants a few more details on my adventures so he can submit my story to ALIVE Magazine. Okay, first, ALIVE Magazine?!?! Whoa! So hip! And, second, I'm in the running?!?! Cool! I give him a brief outline of my background and he put it (among several other candidates) in front of the ALIVE people. I got a call back a few days later with the news that I made the cut! I was excited but tried not to get ahead of myself. I have no idea how the magazine business works so who knows if they would even decide to run the story once its finished. I set up an interview time with Jeremy and hoped for the best. The interview day was in early May and I ended up talking on the phone with Jeremy for more than an hour about my background, my story, what motivates me, what adventure racing is, and how I got there from my start in triathlon. It was a really fun conversation and I was immediately put at ease when Jeremy understood the difference between adventure racing and obstacle racing. They are not the same people! 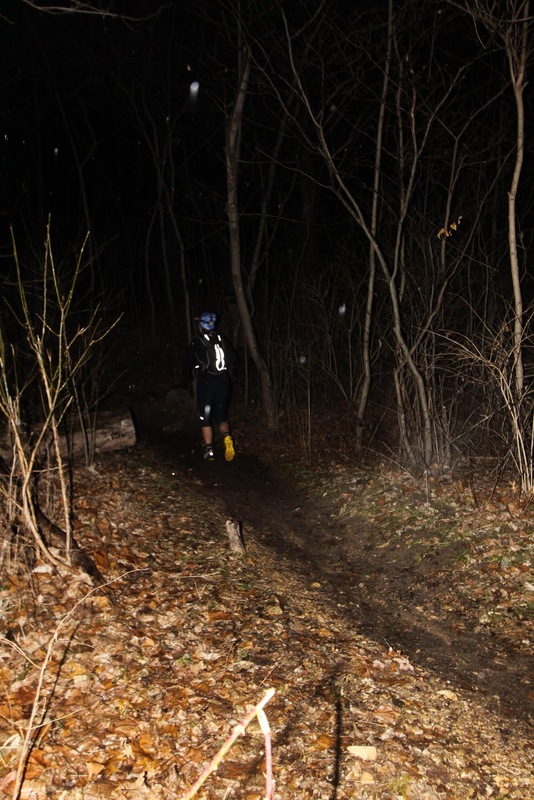 We hung up and I hoped I'd conveyed everything adventure racing means to me, which is a lot. Meanwhile, I'd been coordinating with noted local photographer Attilio D'Agostino (NSFW) on photoshoot details. Yeah. Me! In a photoshoot! I had absolutely NO IDEA what to expect. Would it just be the photographer? Or a whole tent city with hair/makeup people? I showed up to our location on the Huzzah River at the same time as Teri Griege. Attilio was shooting Aaron Fanetti at the time which put me completely at ease because I know Aaron and he's awesome. It was only Attilio and his assistant Pei, both of whom were completely approachable. I got to know Teri a little bit more while we waited and she was awesome too. Pei on the left, Attilio in yellow and Teri on the right. Attilio was great about coaching us through the shots. We did Teri's shots first and watching Attilio work was amazing. First, he was seriously ill with some sort of chest/cough problem and honestly should have been in bed recovering. 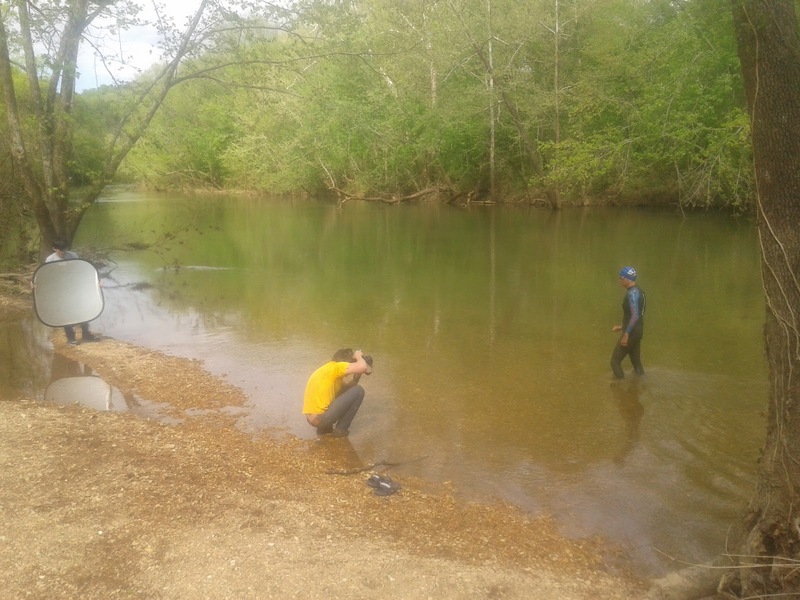 But pretty soon he was sitting in the water to get the best angle for Teri. 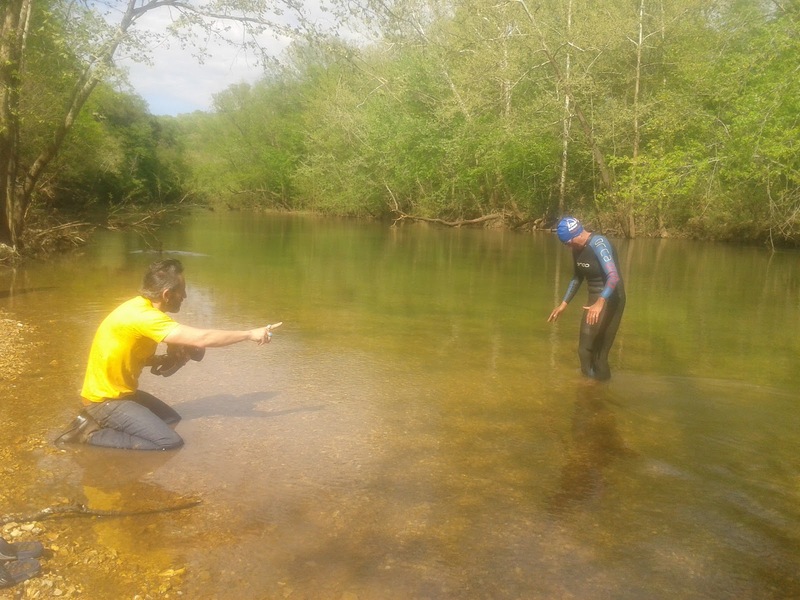 He did several sequences with Teri emerging from the rocky Huzzah, and I watched while sitting in the river taking an "ice bath". Then it was my turn, and Attilio decided he'd get me running with my AR pack. He had a particular spot on the Ozark Trail in mind and we decided to drive over. But, on the way, he noticed some great light on the gravel road, so we stopped at set up camp there. I put my gear on, and just followed his instructions. First I stood on the road so he could position Pei with the reflector thingy, and get his camera settings dialed. Then I would back up about 2-3 meters, and run at the camera for about 10 meters, stop, go back to my "spot", and stand there waiting for further instructions. We probably repeated this at least 20 times. Each run I was instructed to do something slightly different, like look at the camera, look to the side of the camera, start from a slightly different spot, etc etc. About half-way though, Attilio stopped me and asked "Do you have any badass sunglasses?" Why yes, I did indeed, so I got them from my car and we repeated the whole process. As we were wrapping up, another car arrived at the location and I got to meet Shane Perrin! He had an awesome Jeep and Attilio asked him to drive up and down the gravel road to stir up some dust for added drama in my shot. Shane gave it his best attempt, but the recent rains kept any dust firmly locked into the gravel. Shortly after the failed dust experiment, Attilio decided he'd gotten everything he needed, and I was done. Whoop! First photoshoot complete! Some other fun facts about the shoot - I stuffed my pack with my extra clothes to make it look like it was full of gear. Specifically, both hip pockets seen in the final photo are filled with socks...now you know. There wasn't any hair/make-up team and I was completely okay with that. 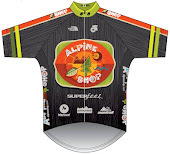 I brought a whole bag full of race/training attire and Attilio said he preferred dark colors so I got to wear my Alpine Shop jersey. I didn't get to meet the fifth featured athlete, Yusuf, and that's sad because he sounds rad. I also brought my bike to the shoot, but we didn't need it since Aaron was doing a biking shot. Teri borrowed my flip-flops in her shot because the gravel was tearing up her feet. After Shane was done, he let me try his SUP board and it was so fun! 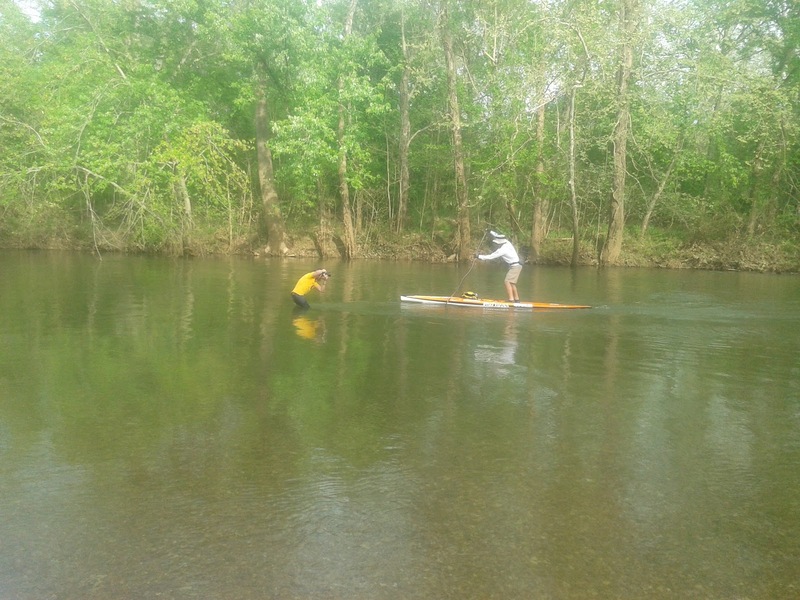 You should definitely check out SUP St. Louis! You're a rockstar! That is awesome. I bet this was so cool, and you absolutely deserved to be there! We're definitely lucky to live in an area with so many awesome athletes and different opportunities.